La Belle Assemblée, July 1814. “The Russian and Prussian Bonnet & Pelisse. 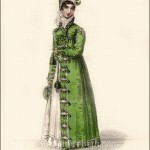 “RUSSIAN AND PRUSSIAN BONNET AND PELISSE, à la-Militaire. Jaconet muslin high dress, with a rich letting-in of lace and embroidery of the same materials round the bottom: the body and sleeves of this dress are richly appliqued with lace. A most delicate blue sarsnet pelisse, trimmed à la Prusse, either with crape or satin of a dark shade. 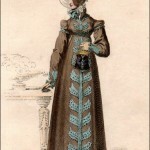 The sleeves and the front of the pelisse are slightly ornamented in the same tasteful manner; the back is full, and fastens round the waist by a fancy military girdle; an appliqueing of crape, to correspond in colour with the pelisse, is let in round the bosom, and on each applique is a small satin flower. A rich lace ruff falls over. 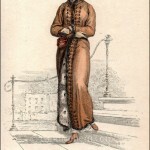 This walking costume is at present wholly confined to the highest class of our fair pedestrians, and we must say, it is equally distinguished for novelty and elegance; it also displays the figure to the greatest advantage. The captivated military bonnet which accompanies it, is highly characteristic of the elegant taste of the inventress: it bestows upon a pretty face that air which the French term piquant. 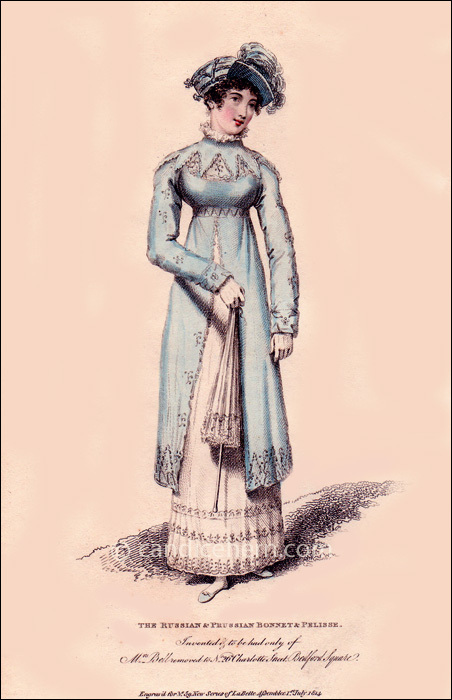 We have observed of some hats which have formerly made their appearance under military appellations, that they gave a look of fierceness even to soft features: the reverse of this is the case with the Russian and Prussian Bonnet, which is one of the most generally becoming that we have ever seen.